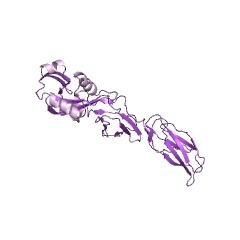 The bacterial immunoglobulin-like (Ig) domain 1 or Big-1 domain is a domain of ~95 amino acids present in bacterial adhesion molecules of the intimin/invasin family, involved in pathogenicity. 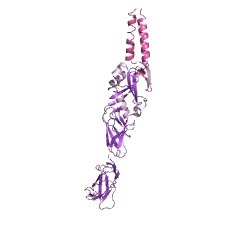 The domain is named after the 3D structure of the domain in enteropathogenic Escherichia coli intimin and in Yersinia pseudotuberculosis invasin, which are both adhesins with a tandem repeat of the Big-1 domain. 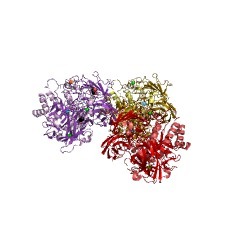 The 3D structure of the Big-1 domain is a beta-sheet sandwich with a topology similar to eukaryotic members of the immunoglobulin superfamily. 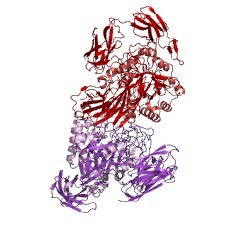 In most intimin/invasin proteins the Big-1 domain occurs in a tandem, N-terminal to a different Ig-like domain, followed by a C-terminal C-type lectin-like domain. 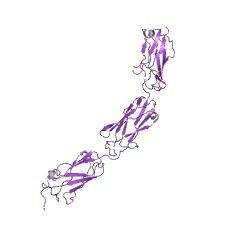 Big-1 can also occur in combination with the lysM domain or in a tandem repeat of several copies. Big-1 proteins are surface-expressed proteins that mediate mammalian host cell invasion or attachment. The tandem of Ig-like domains appears to form a rod to link the bacterial outer membrane anchor to the C-terminal lectin-like domain to interact with their receptors in the host cell membrane [(PUBMED:10201396), (PUBMED:10514372), (PUBMED:10890451)]. There are 13623 BID_1 domains in 1758 proteins in SMART's nrdb database. Taxonomic distribution of proteins containing BID_1 domain. This tree includes only several representative species. The complete taxonomic breakdown of all proteins with BID_1 domain is also avaliable. Click on the protein counts, or double click on taxonomic names to display all proteins containing BID_1 domain in the selected taxonomic class.